Cather, J. Christian, and Jennifer Clay Cather. “A Child with Nonscarring Alopecia.” Proceedings (Baylor University. Medical Center) 18.3 (2005): 269–272. An otherwise healthy girl, 4 years of age, was brought to the clinic with two areas of hair loss involving the left side of her scalp. The child had no significant medical history, she was not on any medicines, and her hairstyle did not use tight or repetitive braiding. The physical examination did not reveal any pustules or scaling on her scalp either. During her visit to the clinic, the girl pulled and twirled the hair on the involved site with her left hand several times. Considering this, she was suspected and clinically diagnosed with Trichotillomania. Trichotillomania refers to an irresistible urge to pull out hair from the scalp. The condition can start at any age; so the patient could be a child, an adolescent or an adult. Around 30% of children with this disorder start showing symptoms before the age of 10. If a child with Trichotillomania starts pulling out hair before 8 years of age, the disease is generally self-limiting. But if it begins during adolescence, it usually turns out to be chronic, and is mostly related to multiple psychiatric disorders, including depression, OCD, anxiety, eating disorders, substance abuse, body dysmorphic disorder etc. Patients suffering from Trichotillomania may contact a dermatologist, but are usually treated with co-management and intervention from psychiatric procedures too. This is a skin condition in which psychosocial aspects of the patient are significantly involved, and they need to be addressed to enable full treatment of the condition. Clinically, two types of Trichotillomania have been identified so far: focused and automatic or sedentary. In the focused type, the patient feels tensed; he or she voluntarily pulls hair, and is relieved after pulling hair. In the automatic or sedentary type, the patient pulls hair while doing other work, which means that they are not even aware that they are pulling their own hair. Children with this disorder are termed as fiddlers, and feel significantly relieved when they stimulate something with their fingertips. Some children may also pull hair of their siblings, dolls, stuffed toys and pets. Many patients with this disorder have psychosocial stressors in their family, such as shifting to a new house, parents getting divorced, arrival of a new sibling, sexual abuse, recent illness, school issues, issues with friends, or hospitalization. Sometimes, child abuse may also be the cause of Trichotillomania. Around 30% of patients not only pull their hair, but also eat it, a condition known as Trichophagia. Some patients who eat hair may also develop Trichobezoar, which can be removed through a surgery only. If the eaten hair reaches the small intestine, a number of complications may occur and worsen the condition, such as intestinal obstruction, perforation, ulceration, intussusception and anemia. 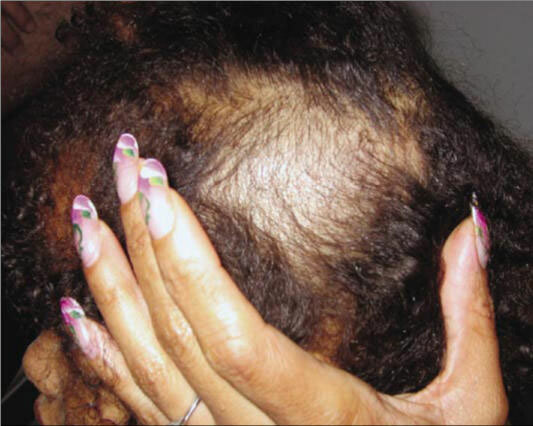 A non-scarring alopecia can be diagnosed upon physical examination and looking into the history of the patient. Proper hair loss workup is expensive, and includes complete blood count, antinuclear anti-body titers, thyroid function tests, fungal culture and scrapings, etc. Scalp biopsy may give an ambiguous diagnosis, but the patient should be referred to a hair specialist for choosing the correct kind of biopsy and the site involved. In addition, clinocopathologic relation is also important, due to which it becomes all the more important to contact a dermatopathologist or a hair specialist only. Upon physical examination, Trichotillomania can be diagnosed if the patient has hair strands of different lengths, indeterminate hair strands or vellus, short broken hair, or empty hair follicle openings. There is no medication as of now that can clinically treat the condition. As it is similar to an obsessive compulsive disorder, most patients are given anti-depressants like bupropion, trazodone, buspirone, and selected serotonin reuptake inhibitors. Sometimes, the patient also receives treatment with lithium, or antipsychotics like olanzapine and pimozide. Habit reversal therapy, a kind of cognitive behaviour therapy, has proven to be effective in treating the disorder in some cases. In 1980, a study was conducted by Azrin et al, which showed a 74% decrease in hair pulling with this method. During this therapy, the patient is taught about the disorder, and is made to exercise relaxation techniques and muscle-tensing activities for treatment. The muscle tensing habit replaces the hair pulling behaviour, and the patient is thus relieved. Last but not the least, hypnotherapy is also shown to benefit some patients with Trichotillomania.